Herbs, annual or perennial, sprawling to erect, often suf-frutescent at the base, much branched and clump-forming, 3-10 dm. Stems obtusely angled, finely scurfy when young. Leaves sessile or short petiolate; blade paler abaxially, oblong or rhombic-ovate to broadly obovate or narrowly oblong or narrowly elliptic, 10-30 × (1-)3-15 mm, thin, base rounded to cuneate, margin repand-dentate or sinuate-dentate to undulate or distal ones or all of them entire, apex rounded to acute, mucronate, densely white scurfy abaxially, grayish green and usually glabrate adaxially. Staminate flowers in short, dense, naked terminal spikes or panicles; calyx 5-cleft, lobes green keeled. Pistillate flowers fascicled in axils. Fruiting bracteoles sessile or with stipes to 0.5 mm, broadly cuneate-orbiculate, compressed, (2-) 2.5-4.5 × (1.5-)2.6-5 mm, usually as broad as or broader than long, much thickened at maturity, united only at truncate or broadly cuneate base, margin deeply and acutely dentate, faces with 2, sometimes swollen, dentate crests or covered with irregular, conic-acute, corky tubercles, seldom smooth. Seeds brown, 1-1.5 mm. Flowering summer-fall. 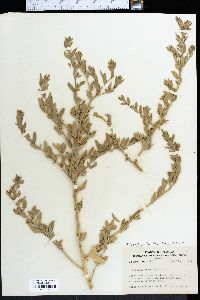 Sandy seashores, coastal salt marshes; 0-50 m; Ala., Conn., Fla., Ga., La., Mass., Miss., N.C., S.C., Tex. ; West Indies; South America (Venezuela and Colombia to Peru). 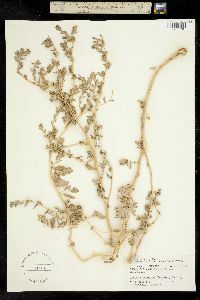 D. S. Correll and M. C. Johnston (1970), treated both Atriplex texana and A. wardii at the specific level. The diagnostic features used to distinguish them, dentate versus entire leaf blades and smooth versus tuberculate faces of fruiting bracteoles, fail singly and in combination. Both taxa were regarded by H. M. Hall and F. E. Clements (1923) as variants of typical A. pentandra, and this worker tentatively agrees with those authors´ conclusions. 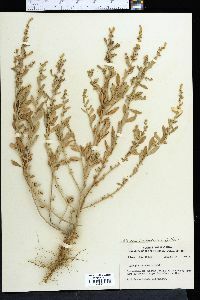 Specimens from Galveston, Texas---the type locality of A. wardii---are apparently intermediate with A. mucronata (see below) and form the basis on which A. wardii was founded. Some of those specimens have been annotated by me and others as A. mucronata. The plants have entire leaves more closely matching those of A. mucronata, but the small fruiting bracteoles, though usually lacking tubercles on the faces, are of similar proportions to those of typical A. pentandra. Atriplex pentandra and A. mucronata are certainly very closely allied.